Looks good. I take it it is stiffer than a stock bar when locked? As slow as possible, as fast as necessary. Two and a half litres of turbocharged diesel goodness. Aye - x-eng say 4 times stiffer. Certainly noticed a difference on the roundabouts on way to work. How easy was that to fit ? Im thinking of fitting that to my new truck. So far I've not gone for a lift but am moving the shocks over from my comp truck. It's a "not much swearing involved" job. Instruction do have a few points left to imagination like not stating what position to put the arms in when fitting and it also forget to say to put the cir-clip on the end of the torsion bar (I didn't forget but it bemused me that it didn't mention it). But all in all it was straightforward to follow and fit. Took me about 3 hours laying down on the driveway at night with a tilley lamp for light! In my case with the 110 it fitted to existing anti roll bar mounts and didn't need spacers to avoid the fuel tank. 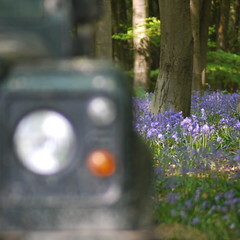 If you can change the drive flange, halfshaft and steering rob ends on a landy then you can fit one of these with ease. 19mm and 17mm socket/spanner for the ARB mount points. 15mm socket/spanner for the flange bolts. T bit (not sure of size) for the free-wheeling hub cap. Drill and 10mm bit to enlarge the holes in chassis ARB mounts. GP Grease for packing the free-wheel hub and drive flange. Could be best to fit while the truck is on level ground, unloaded and not jacked/supported so at it's natural level. I've just changed the suspension on the 110 with some Gwyn Lewis challenge kit and +2 lift. Credit where credit is due, the X-eng ARB when locked turns this set up from a wallowing mattress into a pleasant ride while on the road. Off-road with the x-deflex unlocked it unleashes the awesome that is the Gwyn Lewis challenge suspension. Page created in 0.363 seconds with 31 queries.